"There are many books describing the problems linked to vaccination. Most of them present good information but are quite limited in scope or focused on a few methodologies of research and very argumentative, I would even say emotional, with good reasons. 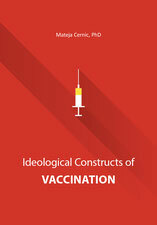 Mateja Cernic’s book presents most if not all different ways to look at vaccination. Although her own final opinion and frustration with the system surfaces at times, her use of the freely available scientific material from the conventional medical world itself, from the manufacturers of vaccines, from the commercial aspect of vaccination, from the legal standing of different nations and from the reports provided by parents, medical practitioners, laboratories, autopsies and comments by highly regarded scientists provides the reader with an inescapable amount of cold, unemotional and objective information, which reveals the reality of a dark side of medicine none of us, healing professionals, is comfortable contemplating. It took me a long time reading her book: I could not stomach more than a few pages every day, asking myself 'How is that possible? How did we allow this to happen?' Many times, my instinctive repulsion at the facts presented told me to close the book and not dwell deeper; and, fortunately, on the other hand, I had that compulsion to know and to understand. 'I got my PhD in sociology in 2014 at the School of Advanced Social Studies - SASS (Slovenia, EU). Since 2011, I have worked at the same faculty as an Assistant Lecturer covering various subjects. My main research interests lie in the areas of power, control, ideologies and discourses in everyday life and medicine.' This book is the extended version of her PhD thesis. Now let us go through the book. After a short introduction, Chapter 2 deals with the social aspects of medicine and vaccination: in other words the many methods one has to manipulate information and population, in general, then more specifically for vaccination, ending with examples of abuse of medical and state power. The sociologist brilliantly emerges here, which is at times difficult to read for a medical professional. I would have put that chapter at the end of the book, but who said one has to read the chapters in a specific order? Chapter 3 is the bulk of the work. Titled “The ideological constructs of vaccination” it is divided into fascinating sections: The decline in mortality from infectious disease shows the natural evolution of most of the disease we are pushed into protecting ourselves from and why the vaccines had almost no influence on their trend. Adjuvants deals with the side-effects (rather the effects!) of the substances used to increase the potency of the vaccines, and the cost we pay for that. Side effects of the vaccines is self-explanatory. Safety and efficacy studies illuminate how poorly those especially important aspects of any therapy are dealt with. Vaccine contamination does not need any comment. The work of paediatricians is extremely unsettling for a health professional to read and does not make one proud of belonging to that world. Adverse effect monitoring system exposes how skewed and incorrect the follow-up of the vaccinated patient is, how it seems to be designed specifically not to register problems...and I wrote “seems” as I still cannot believe and admit that medical practitioners could be consciously part of what appears to be a worldwide conspiration...I simply cannot. Integrity of state institutions illuminates the participation of states and governments. ”Herd immunity” and “harming other people” is one of the most beautiful and convincing argumentation showing the fallacy of those concepts that attempt to vilify those who refuse to vaccinate: if you cannot take the time to read the whole book and want only a sample, this chapter is the one you need. Merger between science an pharmaceutical industry illustrates the well-known adage “follow the money”. After the conclusions chapter, we have appendices with the vaccination schedules of different countries and the mortality statistics, then the list of the references, which might be one of the most important part of the book: each fact, each affirmation, each number or statistic is taken either from an official source or from a well-conducted, peer-reviewed study that no one should be able to dismiss lightly. The sheer accumulation of converging facts and conclusions leaves no doubt whatsoever. Every health practitioner should have this book as a reference; then another copy to lend to patients; and another copy to donate to their local library; and another copy to replace the one that will not be returned. Even if the reader is still offering and promoting vaccinations, which are everyone’s choice, at least it will be done with a full knowledge of what is done, why, what can happen: it is called having fully disclosed information and making an informed decision. Isn’t that the type of freedom millions of people died defending? Dr. Joseph Rozencwajg, MD, PhD, NMD, HMD, DO, OMD, DAcup, DIHom, DHerbMed, DNutr, HbT, FBIH, RCHom, MNZIA, MNZAMH, MNNZ, MNZSN. He started his medical career as a surgeon, first specializing in general surgery, then thoracic and cardiovascular surgery. For many years he worked as a surgeon in Belgium and Israel, then went on to study various fields of natural medicine, obtaining a staggering amount of diplomas and certificates.